I have mixed feelings about this film. On the one hand, Daniel Craig’s Bond films continue by and large to be better than anything since Sean Connery’s films. On the other hand, there was a lot I disliked about this film and my first reaction is to rank it as the worst of the Craig films. In particular, this film was confused, pointlessly-complex, and committed many of the sins which the Craig years have been about undoing. It also represents a seriously wasted opportunity. The biggest weakness of this film is the plot. The plot is needlessly complex and the writers seemed to get lost in it. What’s more, important chunks of the complexity are nonsense. The story begins with Bond in Mexico City where he sets out to kill a man. In the process, he learns of another man who has a ring with an octopus on it. Bond returns to Britain, where we learn that he did all of this against orders and without the knowledge of MI-6. We also learn that MI-6 is being absorbed by MI-5, and MI-5’s boss wants to eliminate the 00 program. 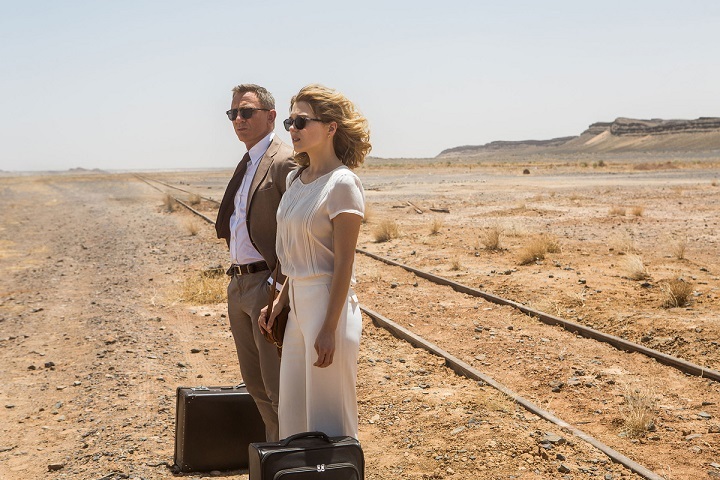 Bond is ordered to stay in London, but he’s running his own mission this time. It turns out that he has been given instructions by Judi-Dench M in a deathbed video to kill a man, attend his funeral and then figure it out from there. So Bond escapes to Italy and attends the funeral. This is where the writing problems begin to appear. Watch for a trend: Bond somehow finds out where the private funeral will be held. Despite the funeral being a who’s who of villains, Bond somehow gets into the funeral and meets the widow. Bond somehow knows they plan to kill her. He somehow figures out when she will return home and arrives just in time to kill the killers who have come to get her. She somehow knows where her dead husband’s associates will meet to discuss how to replace him. Bond goes there and somehow gets through the door and attends a massive SPECTRE meeting. He then gets exposed and he somehow escapes because only one guy bothers to chase him. Now, don’t get me wrong. These scenes are beautifully shot and they’re interesting and tense. 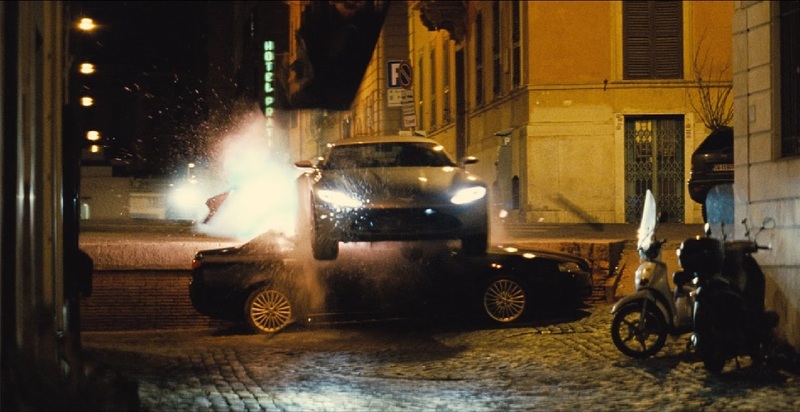 The supercar chase scene is a tad long, but it’s broken up by Bond being on the phone throughout. And if you like, you can imagine all kinds of explanations for each of the somehow’s above. But the fact remains that none of this is explained and it all seems a tad flimsy. And it gets worse from there as this is just the beginning. 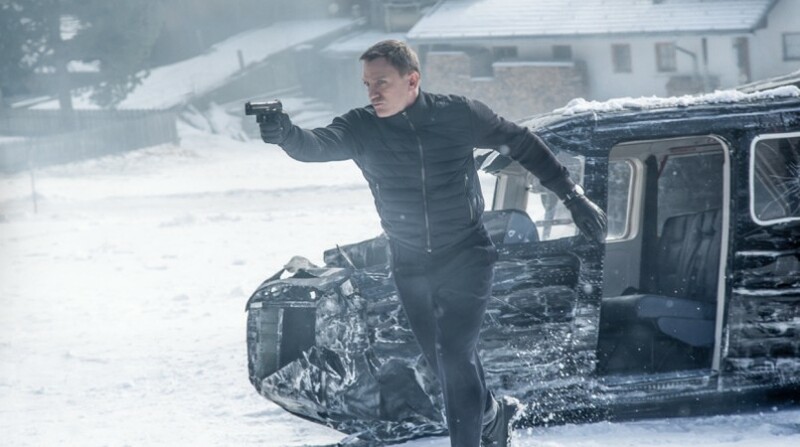 From here, Bond will meet a man who is a hermit but who somehow knows everything about SPECTRE but only gives Bond a one word clue, which Bond will somehow use to find a secret daughter, whom he must rescue. She will use that clue to lead him to a hotel in Africa where Bond somehow finds a hidden room which tells him how to end the movie at a volcano lair (Bond still needs to resolve a brutally obvious subplot which is so packed with somehow’s that it makes you wonder if they did more than give this a cursory thought before including it in the film). Again, let me say that Sam Mendes is a director with an amazing eye for imagery. This film is visually beautiful if not stunning. Everything about it is perfectly handled from a visual point of view. The effects are great. Mendes mixes in some wonderful touches, like old cars and cool little homages to the Connery years, and most of the scenes are moody and interesting. The problem remains, however, that the story surges from visual to visual without ever bothering to fill in the plot points to explain how Bond got to where he got. Equally problematic, the main villain, Blofeld, is a bore, and the plot involving Blofeld proves to be a dead-end to the plot. It’s almost like the writer figured that just introducing the character was enough for the film and didn’t think of what else to do. At the same time, the subplot has a much better villain. He’s more developed and better acted. When he’s on screen, the film just feels tense (when Blofeld is on the screen, the film feels stopped). Unfortunately, the writers all but ignore the subplot and what it could add to this film. And then when they do focus on it, what they do is horribly obvious and rushed. The subplot is where this film really should have gone. Daniel Craig returns as Bond and there is a lot of talk that this may be his last Bond film. While I’ve felt that he’s been an amazing Bond, I am honestly ready for him to leave. This movie, even more than the last, kept projecting the idea that Bond hated his job and wanted to quit... something Craig has paralleled about the role in interviews. So while Craig was again smooth, suave and cold-blooded, and he therefore fit the role perfectly, he also came across as tired and perhaps a little indifferent to the film throughout. This film had multiple villains. 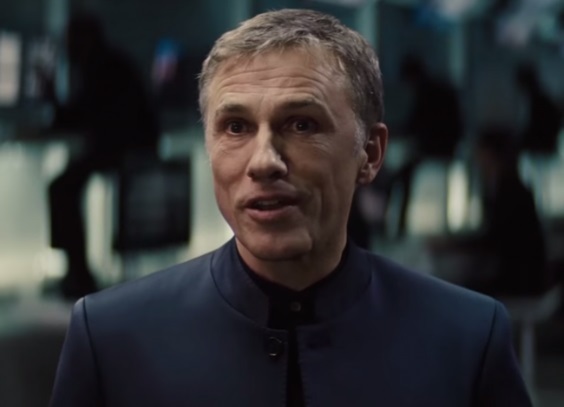 On the one hand, you had the main villain, Ernst Stavro Blofeld, played by Christopher Waltz. With him, you had Dave Bautista as Mr. Hinx, a kind of cross between Donald Grant in From Russia With Love and Oddjob in Goldfinger. And then there’s C.
Hinx is an assassin who fights Bond a couple times. The only “character” moment comes when he applies for the job of assassin at the SPECTRE meeting. Otherwise, he’s just walking muscle. 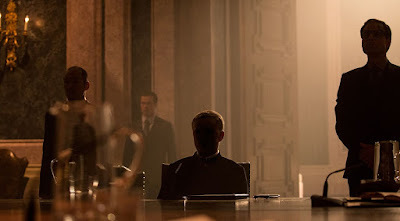 Blofeld is the head of SPECTRE. And when I heard that Waltz would play him, I was excited. Unfortunately, he’s a waste. His character is intensely boring as he drones on and on about things that sound kind of like a life philosophy but really are just words strung together. Even worse, this film commits the cardinal sin of making Blofeld a sort-of relative of Bond’s. He even claims to have sent all the villains Bond has been facing in the Craig movies after him and of ordering the deaths of everyone who has died in Bond’s life. In other words, forget everything you thought you knew about the prior films or Bond’s character because this ill-defined impossible character has manipulated every moment to punish Bond because his own father loved Bond more than him. Ug. First of all, the idea that one person could cause all the unrelated events in the prior films, each of which involved unique motivations and plenty of luck, is ludicrous... so Blofeld somehow got M to piss off Silva before Bond was even an agent just so Silva would one day go after Bond? Yeah, right. Secondly, the idea that the world is essentially divided between one superspy and his sort-of supervillain brother is comic book thinking, and it takes it too far away from reality. 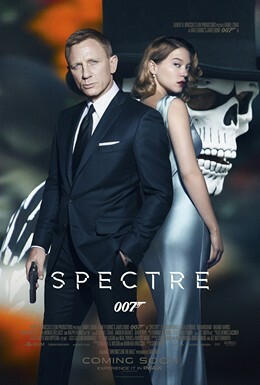 Third, how can someone so obsessed form an organization like SPECTRE? It’s nonsense. 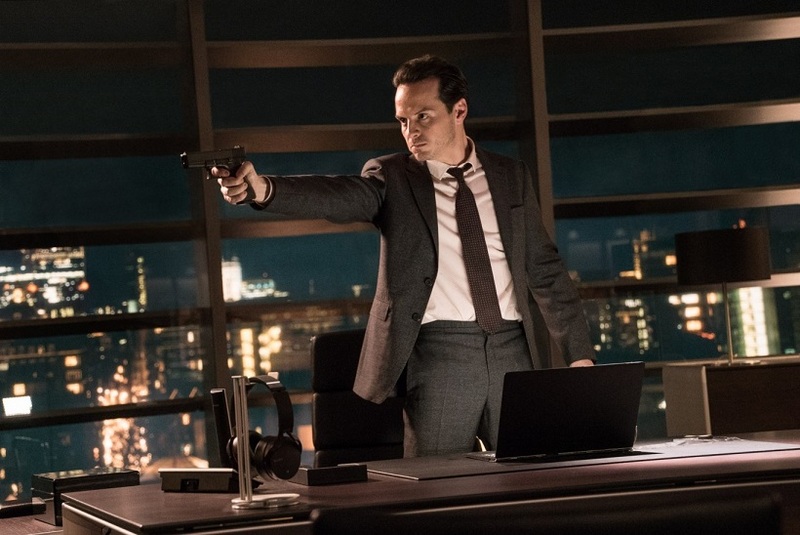 The most interesting villain is Andrew Scott as Max Denbigh or “C”. He runs MI-5 and he’s entered into a deal with SPECTRE to build a surveillance empire on behalf of the British government all in the name of stopping terrorism. What makes him interesting is that it’s easy to see him as a real creature haunting governments everywhere. He thinks he’s the good guy because he’s obsessed with bringing order to our chaotic world and he genuinely thinks that causing a few deaths and doing a dirty deal is worth the benefits the world will get. He can’t even see the danger of working with someone like Blofeld. Unfortunately, his character gets badly neglected by the film in favor of Blofeld, so we don’t see him much and we learn even less about him. What’s more, what we do see points so obviously to him being a villain that there’s no mystery to this. This is a lost opportunity. This would have been a better film if SPECTRE had been a red herring and C was the main villain, or if C was not a villain and he was being framed by SPECTRE. Instead, he’s just there to give M and Moneypenny something to do in the film. I don’t want to make it sound like I hated this film. I didn’t. I thought it was a decent movie and I enjoyed it. I enjoyed it a lot more than most of the Bond films after the Connery years. It was beautiful and had the travelogue film these films need. The pacing was excellent and the story offered enough to hold your interest. The ‘cool’ moments were indeed cool. The humor was funny. The action was tense. Craig did his usual great job with the role. The Bond girls were pretty, especially Monica Bellucci. Andrew Scott was creepy and believable. It was excellent escapism and could be the best “mindless action film” in the series. Where this film disappointed me was that the film never bothered to explain so much of what happens except by saying, “Hey, he’s Bond... just accept it.” I also felt that Blofeld was a waste and his relationship with Bond was a horrible idea to inject, and was done so just to add a punch which his character was lacking in the story. It also bothered me to a degree that what made the Craig films so different was the return to basics, i.e. there were no supercars chases, no impossible stunts, no buildings blowing up, no nuclear-sized explosions, no larger-than-life villains, and no volcano lairs, but this film brought all of that back into the series. It was a retreat to fantasy. So what I would say about this film is that it proved to be a genuinely missed opportunity. If they had kept more focus on Bond the investigator, had eliminated Blofeld and focused on the subplot, and bothered to connect a few more dots, this could have been the best film ever. But they didn’t. Ultimately, I would rank this as the worst film of the Craig era as a Bond film, even as it probably gets the highest marks in the series as a mindless action film. Good review Andrew, like you, I ahd high hopes for this movie when I heard of all the talent envolved. Like you, I was underwhelmed by the final product. Blofeld is Bond's long-lost brother!? Come on.....shades of Kylo Ren. I haven't seen this one yet but I more or less knew what the spoiler would be so I forged ahead. Even worse, this film commits the cardinal sin of making Blofeld a sort-of relative of Bond’s. here it reeks of... either fan service (and what fan would want this?)... or the need to make things seem more important and momentous. And your theory about making C the villain? At one point, he was the main villain. Read this. Having said that, you're right about look of the film. Going all the way back to American Beauty, Sam Mendes has been a gifted visualist. Roger Deakins wasn't available this time, so the cinematographer on this film was a guy named Hoyte van Hoytema (he's, uh, Swiss) who also shot Interstellar. I think I can wait until it comes out on tv. Sounds like they should have renamed the film to Deus ex Machina. I can't figure out if the writers and directors are too stupid to write a cohesive plot or they think the audience is too stupid to not care. Both are cardinal sins. For my money Casino Royale is the best Bond film ever made, but the quality of the Craig Bond movies has steadily declined (Casino Royale was merely good, Skyfall was awful) so I am going to wait for Spectre to hit cable. Thanks Shawn! That was my feeling exactly. I was excited by everything I read, I enjoyed the movie for the most part, but I felt underwhelmed. Patriot, It was one of those moments that made you groan. Scott, Exactly! This is "small universe syndrome" and I hate it. Just as in Star Trek TNG there is no reason that the Enterprise bridge crew needs to handle every single event in the known universe, there's no reason that the entire spying world should be the private refuge of a small family. It's annoying to be told that all events arise from a tiny group of people. It's even more annoying here to be told that everything that happened in the last few movies was all manipulated this by this one guy. It's nonsense, and it makes everything feel fake. And yeah, you know the only reason they do it is to add punch to a story that's missing a spark. That's interesting about C. He was seriously underused. He was easily the creepiest villain they've offered yet, and yet barely saw him. Koshcat, That's kind of how it felt. Bond repeatedly simply finds himself where he needs to be with whatever he needs to move on to the next scene without ever earning any of it. Don't get me wrong... it's stylish and fun, but mindless. Anthony, Agreed. His first was his best and it's slid a little bit in each film after that. 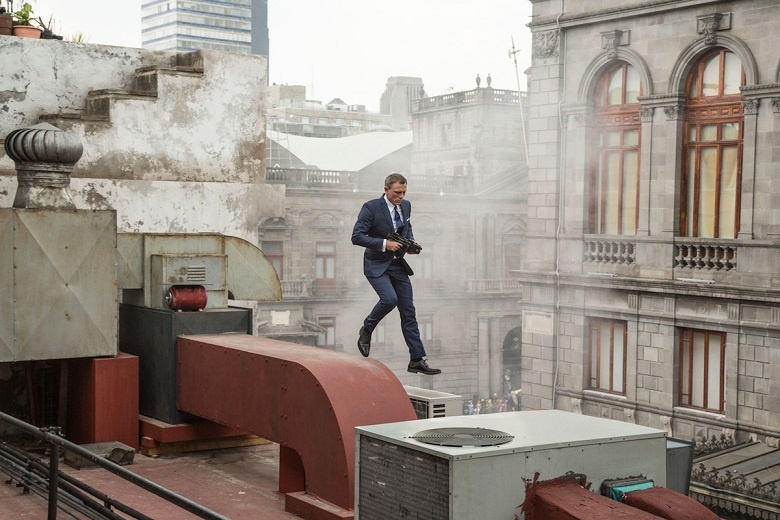 It's hard for me to say if this was better than Skyfall. I would say they are very similar in many respects. I must state for the record that there are two CLICHES, (Tropes what have you....) that must DIE and DIE IMMEDIATLEY and not be used anymore!!!! 1) I am sick of the "heroes" fleeing the bad guys by car and all of a sudden at an intersection, a larger vehicle appears out of nowhere to T-bone the vehicle carrying the good guys!" So no trained agent ever thinks to look both ways at every single intersection? C'mon! This isn't limited to movies, I swear "Person of Interest" has this happen twice an episode. C'mon guys! Drop this stupid meme. 2) This goes back a long time. Can we please stop having the hero aim a 9mm pistol at a target about 500 yards away, usually from a moving and shaking platform, and hit the target every time like he was Annie Freaking Oakley? Huh, please? Is that too much to ask? 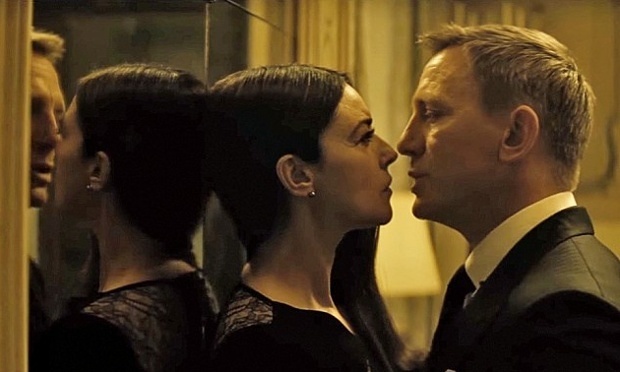 almost two decades too late Monica Belluci finally makes it into a Bond film, with "Spectre." Sad, still an attractive woman, but nowhere near as hot any more. My wife just said, "Wow she looks old now." just read this review, and recently so the film on Blu-ray. I must say you nailed it.It is visually stunning, has the requisite great action sequences, and Bond girls, and some really fine acting talent. But, yes, the film is overly complex and it takes away quite a bit. One of the very things that made From Russia with Love my favorite was it's simplicity and plausibility. Sadly, the plot is an unforced error, and that is a shame. This was set-up to be one of the best of them all, and fell far short for most, if not all the reasons you mention. But, that seems to be the way of Hollywood these days. Storyline and plausibility gives way to dazzle.